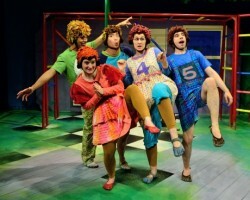 Ben Lurye, Joey Ibanez, Aviva Pressman, Katie Culligan, Valerie Leonard, and Jacob Yeh in 'Five Little Monkeys.' Photo by Bruce Douglas. 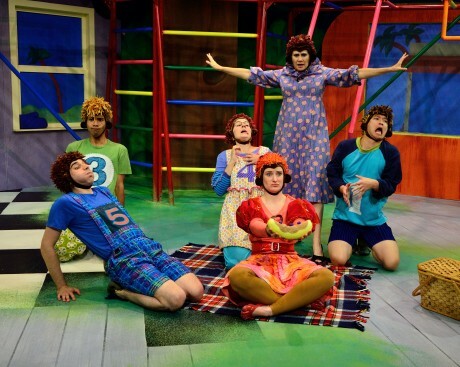 Five Little Monkeys, a stage adaptation of the children’s book series by Eileen Christelow, is now playing at the Adventure Theatre MTC. This stage version (adapted by Ernie Nolan) is directed by Karin Abromaitis, and stars Valerie Leonard, a Helen Hayes Award Nominee. 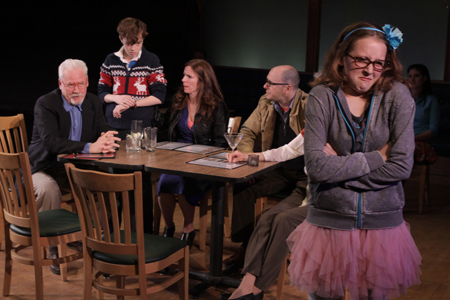 The play is cleverly put together, and portrays the excitingly mundane mishaps among siblings, children, parents and neighbors in a family of “monkeys” that is so relatable and appropriate, it’s almost more than human. Breathless, Mama (Valerie Leonard) asks us to come in for a quick cup of coffee and a lovely little chat, while the little ones are asleep. Inevitably, however, she has forgotten something and has to run out quickly, so she asks us to watch the kids and promises us that they won’t give us any trouble at all. We know, of course, from the expression on her face, that’s probably not the case, no matter how well-intentioned their schemes! For the duration of the play, we spend an intimate twenty-four hours with this family, supposedly our “neighbors,” as observers while Mama desperately tries to organize shopping trips to the mall, picnics in the park, and bedtime. Joey Ibanez, Ben Lurye, Katie Culligan, Aviva Pressman, Valerie Leonard, and Jacob Yeh in 'Five Little Monkeys.' Photo by Bruce Douglas. Alternating between Mama’s perspective and that of Monkeys 1 through 5, (played by Jacob Yeh, Katie Culligan, Joey Ibanez, Aviva Pressman, and Ben Lurye respectively), the story is told cleverly in rhyme, with up-to-date references to things like Mama’s blog and cell phones. The monkey family, including Mama, swing and bounce acrobatically about on a colorful jungle-gym set that is just begging for you, I mean, kids to play on it. Leonard is believable and endearing as a flustered mom; graceful and dramatic, she is also not afraid to get silly with the kids when they give her a surprise birthday present. The five monkeys have distinctive characters, with Yeh playing the “responsible” elder, Culligan a flashy fashionista, Ibanez a goofy prankster, Pressman a thoughtful bookworm, and Lurye the “baby,” who wants desperately to be included and prove that he can do things, too! 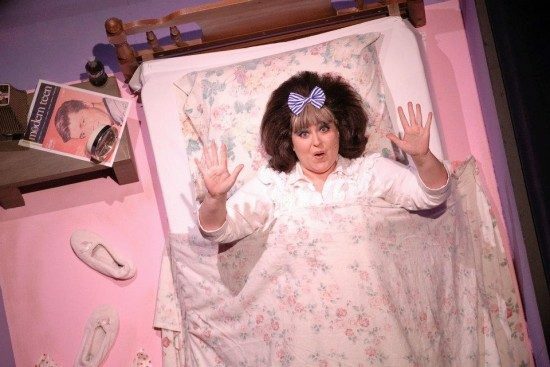 All of the actors are polished and appear to have a wonderful time portraying the chaos of a modern home…to the delight of the audience. Complicated choreography bring to life scenes you would only expect to see in a cartoon, and allows for some excellent mess-making as the five monkeys try to make their mother a birthday cake. There are even a few special effects, and a fantastic “ballet” scene to the score of Swan Lake, as the kids are brushing their teeth and getting ready for bed. One interesting and sometimes disorienting aspect of the show is the way the five monkeys would occasionally switch themselves out for a cut-out version of themselves, as the actors portrayed additional roles. It was very creative, if it took some getting used to, but what makes it work is when the actors play off of the cut-outs as if they are real. So much about this show is fun and true to life, honoring the experiences of both parents and children. I was delighted to find that indeed, every family could find some way to relate to the five monkeys and their not-always-perfectly-organized Mama. Five Little Monkeys is a masterpiece of creativity, and I personally applaud the work that went into bringing the books to life in such a modern, multifaceted way. With such talented actors, colorful costumes, and fun set, I hope you get a chance to go to the Adventure Theatre MTC to see the play, no matter who you are! Five Little Monkeys plays through June 3, 2012 at Adventure Theatre MTC, 7300 MacArthur Blvd (Glen Echo Park), in Glen Echo, MD. For tickets, call 301-634 -2270 or order them online. Erica S. has spent a lot of her time looking for ways to combine her loves of the performing arts, literature, and world cultures in both her professional and personal life. She received a B.A. in English from George Mason University in 2002, and went on to study folklore in graduate school, where she discovered professional storytelling. When not working at her day job, she finds opportunities to perform as a storyteller and vocalist. She also sings with a local choir called the Six Degree Singers, and sometimes finds time to read for pleasure and write.